VINTAGE Original 1980r Australian Daybill Movie Poster approximately 13" x 30", folded as issued, fine - very fine condition (see enlarged scan for condition). This item comes from a huge collection of original Movie Memorabilia, Posters, Australian Daybills and Lobby Cards and I will be adding more on a regular basis. For More detailed information on Australian Movie Posters, Linen Backing, Framing Tips and The Truth About Autographs see my Guides. I specialise in the Australian daybill but also stock a wide range of US and International movie posters and Lobby cards. Many of the items that I sell have been sourced from old cinemas, theatres and long time collectors. I have an inventory of movie memorabilia ranging from the 20s to more recent times including some of the most highly sought after film posters. I also have the world's largest retail collection of posters for Australian made films. 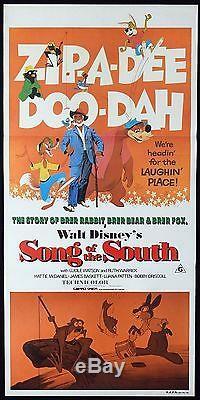 The item "SONG OF THE SOUTH Rare Original Daybill Movie poster Disney 1980r" is in sale since Tuesday, September 4, 2018. This item is in the category "Movies\Movie Memorabilia\Posters". The seller is "moviemem" and is located in Palm Beach, QLD. This item can be shipped worldwide.